Last year Zagat named Pittsburgh, Pennsylvania the No. 1 food city in America. Maybe that is why three of the restaurants featured here are in Pittsburgh. Then way farther south, Tallahassee, Florida has its share. As the state capital, it has to serve good food to keep politicos and visitors alike happy. 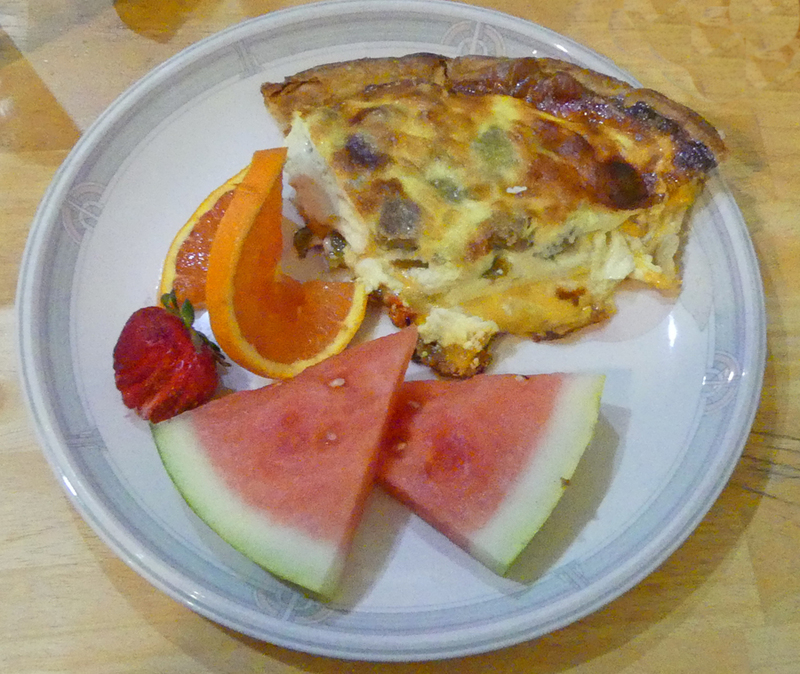 Manocos Colorado may be a small town but it can hold its own when it comes to great breakfasts. Of course, California is known for food innovations so it's no surprise Palo Alto, California has a great breakfast spot. Naturally there are many others I have not yet visited. When I do they will be another grouping of Beautiful Breakfast Bonanzas. Canopy Road Cafe in Tallahassee, Florida will leave you happy and very full. They are famous for their Sweet Potato Pancakes. The day our group of travel writers visited, all of us sampled something different and all were happy. So get quirky and try their Funky Monkey pancakes with chocolate chips and banana or the Fat Elvis with what else peanut butter chips, bananas and bacon. Other choices include great omelets like the Big Daddy or Big Man on Campus. If that repetitious "big" gives you the idea that the servings are very generous, you are not wrong. I opted for their Florida French Toast and was rewarded with a plate overflowing beyond my imagination. 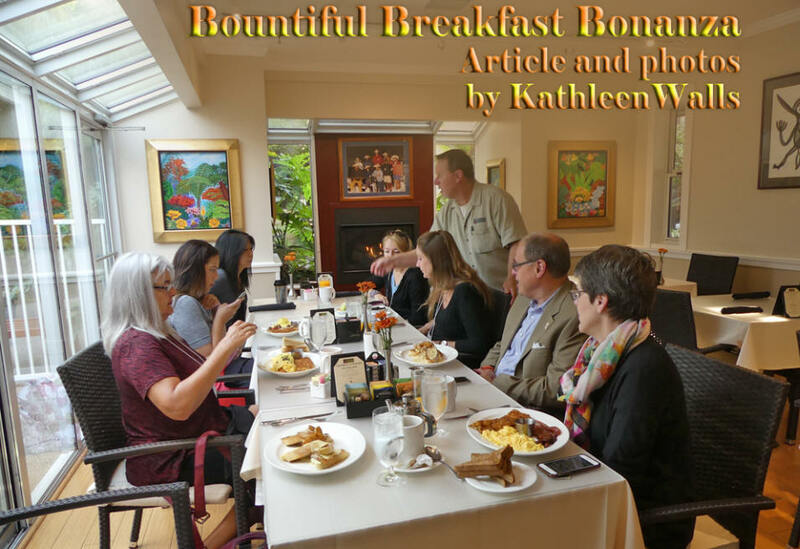 The perfectly browned, egg-saturated toast was topped with a bonanza of banana slices, blueberries, and strawberries. It was blanketed with sweet tasty sauce and a large dollop of whipped cream. If that wasn't magnificent enough, there was butter and syrup on the side. WOW! 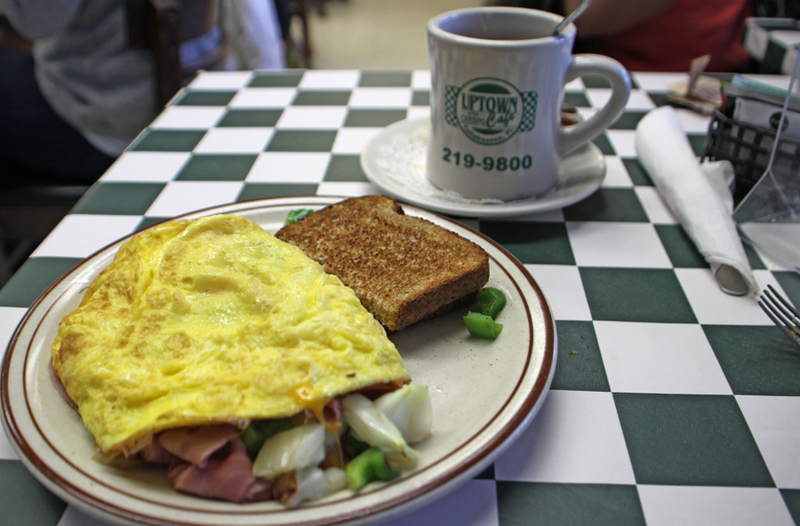 They consider themselves a classic diner. The food is classic and the portions are diner-sized. It's a win-win place. 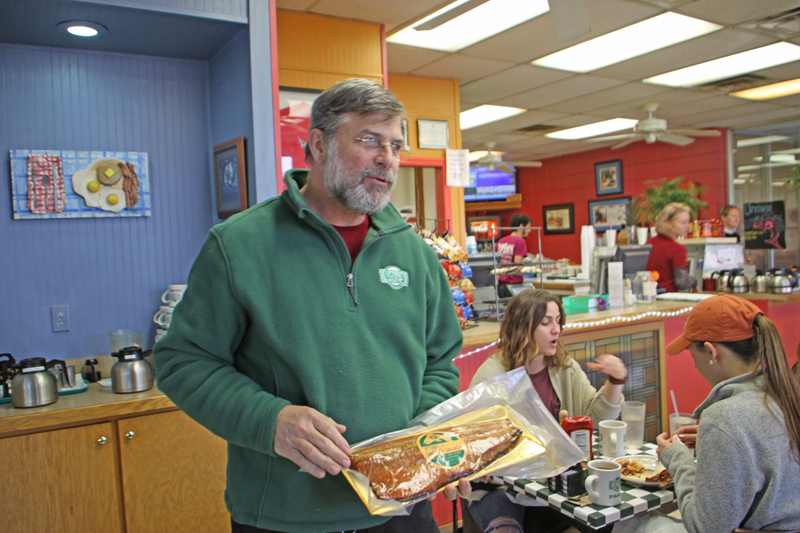 Uptown Cafe is another Tallahassee breakfast spot that can hold its own. Fred and Beth Tedio, Uptown's owners, serve breakfast/brunch all day long and have been doing it for 30 years. That's a clue they are doing something right. Uptown Apricot Glazed Smoked Salmon is one of the things they brag about. Fred gave us a smaple. Take a bite, close your eyes and you are transported to Heaven. 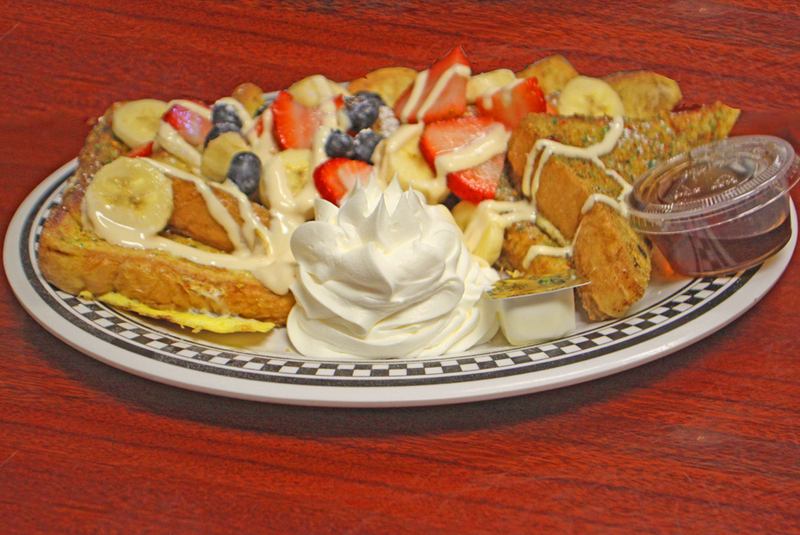 Another special is Their Banana Bread French Toast. One taste and you'll know why. The other choices run the gamut from simple biscuits and gravy–perfectly seasoned– to their Mancakes, a pan-sized pancake stuffed with bacon, sausage and ham, then topped with two eggs cooked your way. Their secret, everything is homemade from scratch. 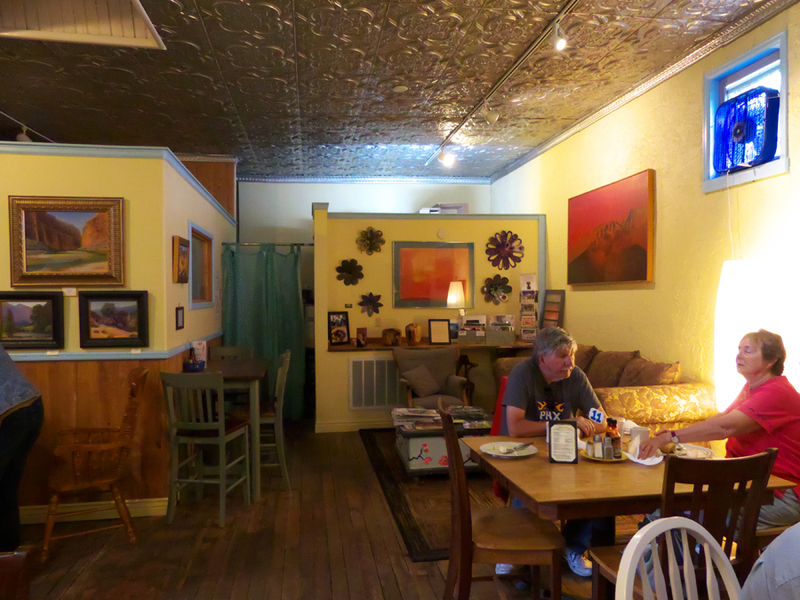 Absolute Bakery & Cafe in Mancos, Colorado has a setting worth of the organic and local food they serve. It's housed in a 100 year old building set between the foothills of the La Plata Mountains and Mesa Verde. You'll revel in the books and art tucked into its many nooks and crannies but the breakfast will take your breath away. It's not only the freshest ever, but the most beautiful. 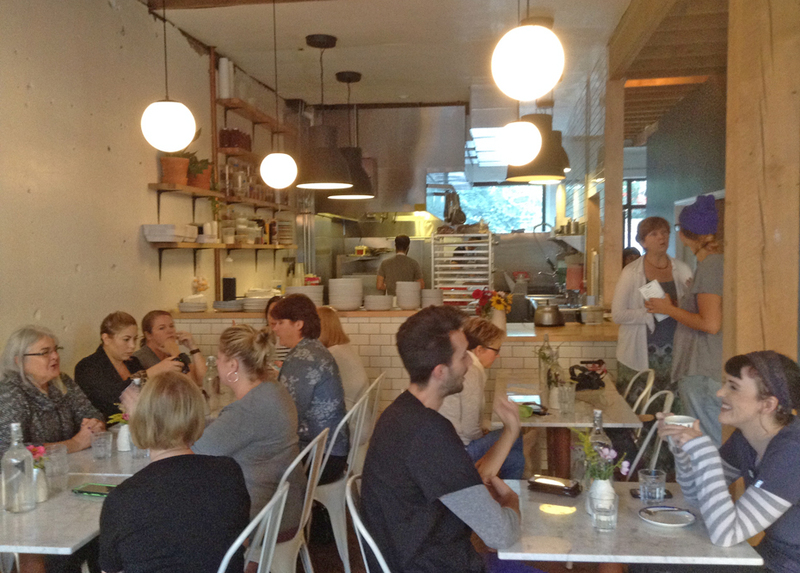 Absolute may be the best little bakery you never heard of. It has a 70s hippy feel about it and made me feel at home instantly. Of course the smell of freshly baked bread drifting through the door didn't hurt a bit. Absolute Bakery & Cafe combines atmosphere and a very tasty food selection. Dinah's Poolside Restaurant in Palo Alto, California is part of the Dinah's Garden Hotel. 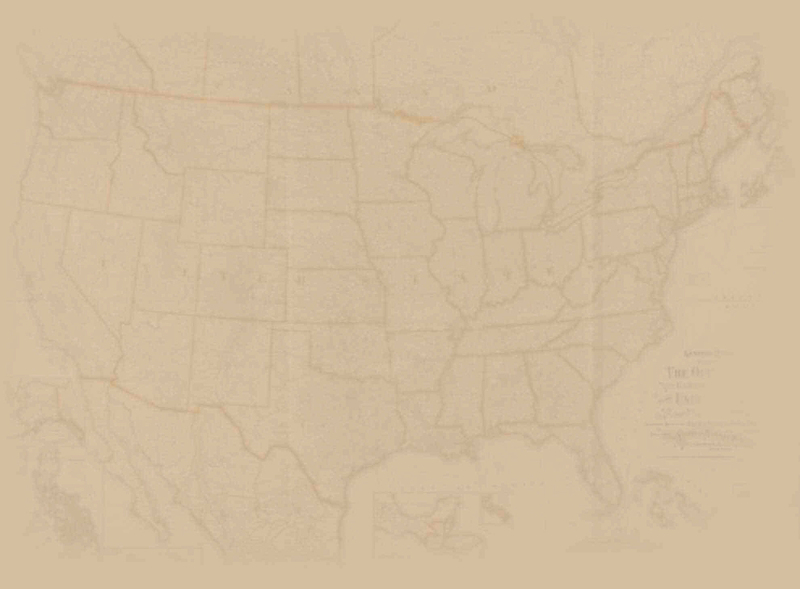 The hotel sits on the historic El Camino Real often referred to as "The King's Highway." Indeed the food here is fit for a king (or queen.) 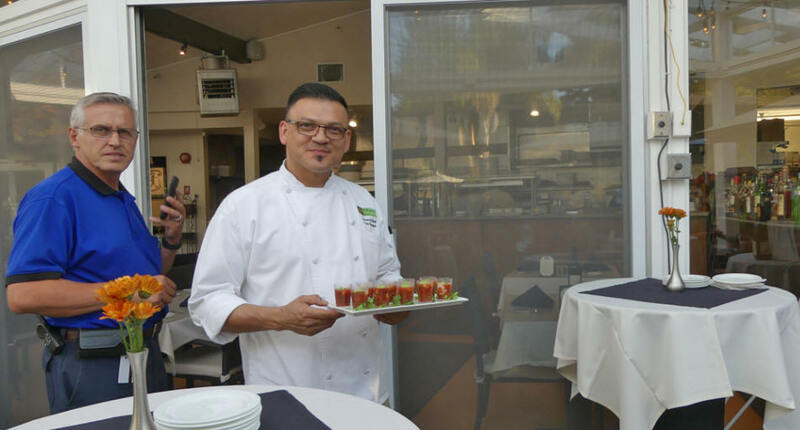 Chef Gerry Naranjo makes sure of that. The restaurant is set around the pool but offers indoor and outdoor seating. (indoor is shown in the header photo) Dinah's Poolside Restaurant serves not only breakfast, but lunch, happy hour with cocktails, and dinner. The new fad of "Farm to Table" was in vogue here long before the phrase got coined. Hotel Manager, John Hutar, told about when the restaurant was first leased to a restaurateur. The owner and founder, Raymond Handley, insisted that "the orange juice always be hand squeezed." I sampled the orange juice and it did taste hand squeezed and fabulous. Likewise, the Sourdough French Toast I ordered was so light and tasty. 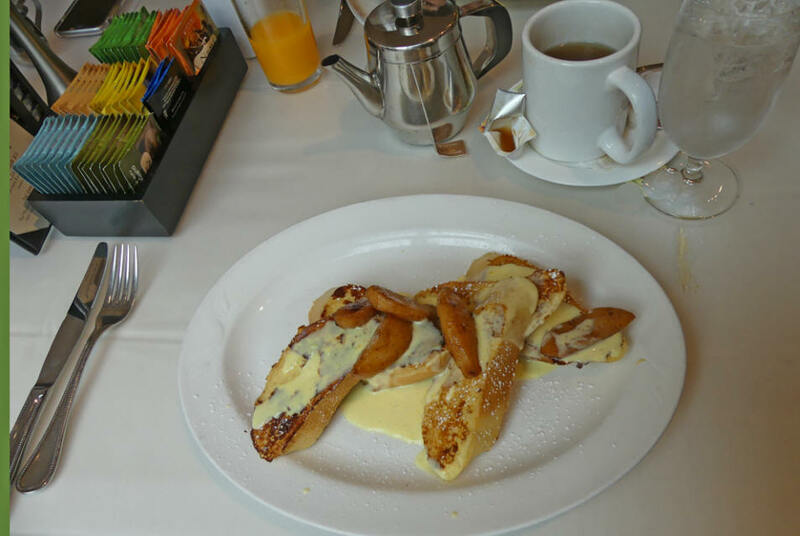 It has a orange zest and vanilla bean crème anglaise sauce and was topped with luscious baked apple slices. The other journalists that ordered dishes like the American with its 2 eggs, 2 bacon slices, 2 sausages, toast and choice of hash browns or fruit or one of the three different versions of Eggs Benedict were also well pleased. There are no wrong choices at Dinah's Poolside Restaurant. 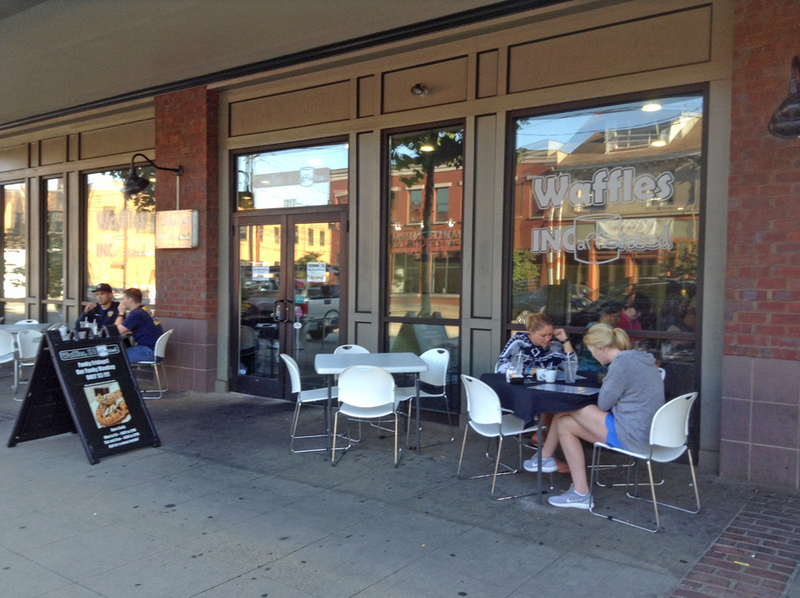 Waffles, INCaffeinated on the Southside of Pittsburgh takes waffles to a new level. This isn't your regular sprinkle-‘em-with-powdered-sugar waffles. Oh no! To start with Tahj Merriman, Executive Chef, doesn't use just regular flour. It all starts with a sourdough waffle. Going from there, your choices are only restricted by your imagination. 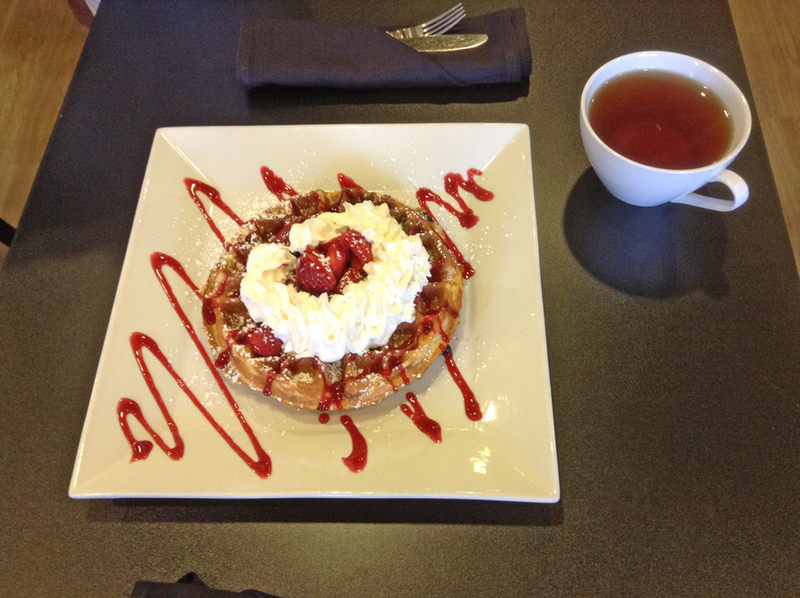 If their menu offerings like their Megaberry, one of their waffles with blueberries and raspberries on the inside, fresh berries tossed in their vanilla bean syrup topped with a mountain of whipped cream, aren't enough try Waffles Imaginated. You choose your own toppings and mix-ins from over 30 items. Then there are another 33 choices that can be toppings only. The range is unbelievable from apples and raisins to peanut butter chips or crab meat. You can do the same with omelets or crepes. If your huge breakfast doesn't fill you up, they offer desserts like Funky Monkey, half of a chocolate chip waffle topped with bananas, peanut butter chiffon and chocolate sauce, or Foster's, a half of a walnut waffle topped with bananas, walnuts, vanilla ice cream and drenched in their own Fosters sauce. Their menu is pretty extensive and the beverage choices are numerous. Besides the usual, they offer a variet of teas, lattes, cappuccinos, and seasonal offerings. Pamala's P & G Diner in Pittsburgh opened in 1980. It was Pamela Cohen and Gail Klinginsmith's first restaurant. Since then, they've expanded to eight restaurants so obviously they are doing something right. Their extensive band of followers thinks so but their greatest endorsement comes from the highest in the land. We all know President Obama has been accused of everything from founding ISIS to shooting policemen but no one ever accused him of fooling around on Michelle. However, in April of 2008 while campaigning in Pittsburg Strip district, he fell in love. Here's how it happened. 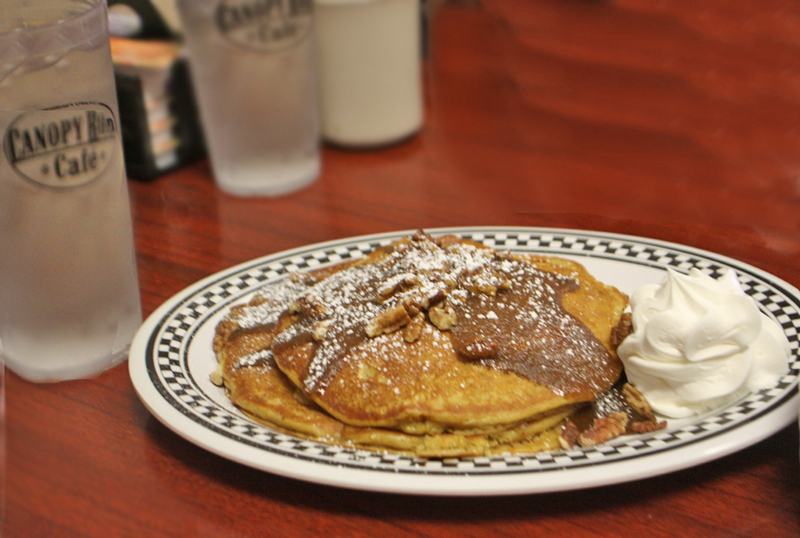 President Obama had breakfast there at Pamela's P & G Diner and tasted those heavenly pancakes. It was love at first bite. 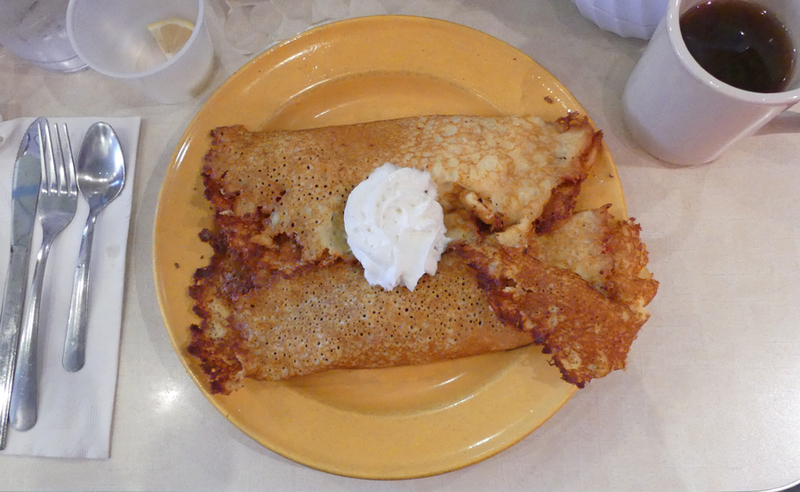 One of the newspapers reported his comment regarding the pancakes at Pamela's just before he answered a political question, "Before I answer this question, these really were maybe the best pancakes I've tasted in a very long time. Get some take-out. You don't even need syrup on them. They've got [these] crispy edges. Yea, they are really good." The presidential love affair continued as President Obama invited Pamela and Gail to cook breakfast for him, his family and the veterans of war on Memorial Day, 2009. Then they were invited to attend his second inauguration in January 2013 as his guests to welcome him back for his second term! If that's not a worthwhile endorsement, I tried the Strawberry Hotcakes stuffed with fresh strawberries, brown sugar, sour cream & topped with whipped cream. Heavenly! 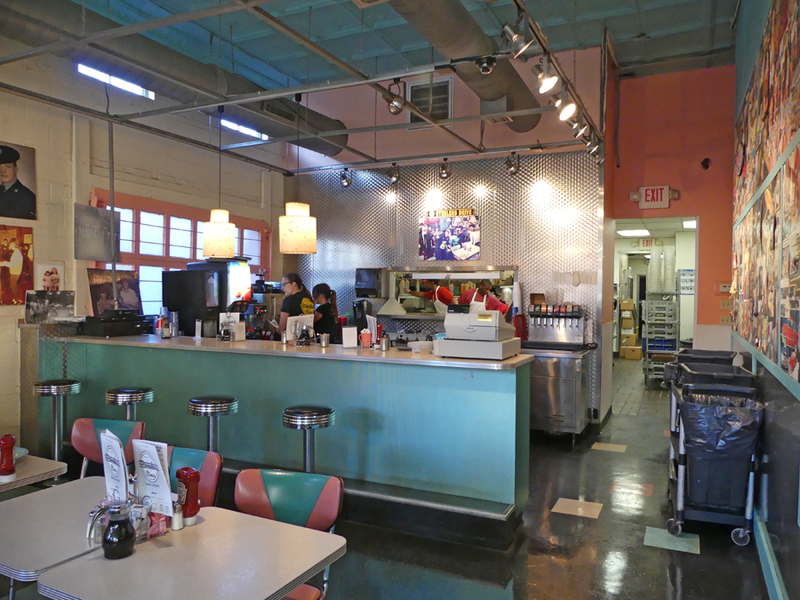 Each of their restaurants is decorated in a retro theme. We dined at the 1950s one and enjoyed looking at the photos all over the walls from that era. Of course, the color scheme is pink and green. Their love and pride shines out from everything from the food to staff and decor. The Vandal is small. The decor is minimalistic. Its menu simple but its taste experience is huge. Chef Csilla Thackray and owner Joey Hilty see to that. The menu changes often depending on local availability. There were only seven items on the menu but all looked interesting. After all it's better to do a few things well then a bunch of things halfway. I choose the Classic plate, two fried eggs with ham or bacon, salad and toast. I opted for the bacon. When the plate arrived it was filled to overflowing. 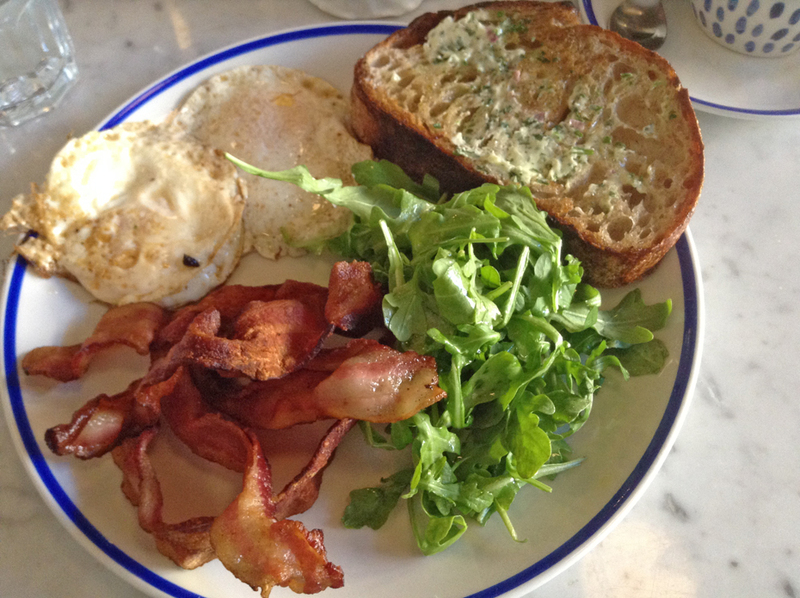 My eggs were a perfect easy-over, tons of bacon and the toast was a delight to the eye and the tastebuds. I sampled my neighbor's Red Potato Hash. It was filled with nicely quartered potatoes, confit onion, hot and sweet peppers, corn and tossed with sour cream.An unusual dish quite tasty and spicy. To top it off there is a terrific tea selection for us non-coffee drinkers. I was happy to find my old friend, Earl Grey there. So of you are looking for lots of choices of ordinary items go elsewhere but if you want some innovative choices beautifully done, The Vandal is the spot for you.